If you love your health and you like to eat healthy foods and buy quality products, then it is important to understand where your food comes from. This is especially relevant if you buy foods imported from China, Vietnam, Hong Kong, Thailand and other asian countries. Unfortunately, you just don't know what is in many asian foods because those countries do not have food inspectors, food regulations, quality control systems or legislation that supports healthy food processing. On top of all that, there is an enormous amount of pollution creeping into their food chains and many companies that operate in these non regulatory countries have no hesitation in using lots of chemicals some of which are banned in the western countries. And in the case of Asia where corruption is endemic, the adulteration of food stuff with cheaper imitation fillers is common place. Nowadays, most international food manufacturers know that western consumers are becoming increasingly suspicious of food products made in china and other asian countries, so they prefer to hide the country of origin by exploiting lax labelling laws. For example, "Highliner" fish products all come from China, even though the box says 'Product of Canada'. The reality is that the fish come from China and are then processed in Canada. The processing involves adding a simple coating to the fish and then packaging it in Canada, thus allowing the company to disguise the source of origin. These fish are raised in pens using chemicals that are banned in Canada because of their carcinogous properties but which remain legal in China. This point was exposed on CBC TV's 'Marketplace' some time ago. International food processing companies all over the world are aware of the need to hide asia as the country of origin. In early June 2012, A Current Affair aired a story on frozen vegetables imported from New Zealand to Australia. As it turns out, if a food item from Coles or Woolworths, two of Australia's largest supermarket chains, is labelled as their Home Brand, then that food is more than likely to have come from China. Products made by McCain’s, Birdseye and other supposedly reputable companies based in New Zealand now purchase food products from China and sell them under their own label. If you are purchasing food, you need to check the label before buying it. So what should you look for on the label? If the label indicates "Product in Australia" then it means it has been made in Australia from Australian ingredients so it's the best option. If the label indicates "Made in Australia" then it means the food has been made in Australia but with significant imported ingredients. So, while this label sounds good, it is actually a bit misleading. Now let's look at "Made in Australia from Local & Imported Ingredients". This label applies to unpackaged fresh and processed fruit, vegetables, nuts, fish and pork. However, the manufacturer or distributor is under no obligation to state the country of origin for the imported ingredients so this label isn't very helpful if you want to identify suspect countries. Nor is the manufacturer or distributor obliged to state the percentage of imported ingredients. So, once again, the label isn't very helpful when the food could be 90% imported! As you can see, the labelling laws in Australia aren't clear and they give manufacturers a great deal of wiggle room. Unfortunately, what this means is that if you want to play it safe, buy mainly "Product of Australia" foods and rely more on your local farmers markets and organic food sources. 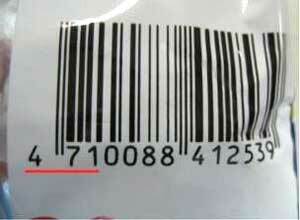 Some people believe that you can use the barcode on a food package to identify it's source of origin. While it's true that the first 3 digits of any barcode indicate a specifc country code, it is not true that you can identify the food's country of origin from the code. Companies can buy and sell barcodes to meet their needs and any country can sell barcodes with their country prefix to anyone, so a manufacturer can buy barcodes for each country in which they intend to sell their product. You could buy an imported product with an Australian barcode and you could buy a locally made product with a foreign prefix barcode. An Australian company can put their Australian prefix barcode 93 on any of their products regardless of location of manufacture - most home branded Australian products will have an Australian 93 barcode regardless of the country where it is sourced from. There is no real way to identify the country of origin from the barcode unless the producer decides to tell you. Here is a partial list of identifiers. Note that the Australian barcode prefix is 93.